It’s always in the back of your mind, car accidents. Whether you are driving in your own town or out on the open road, there is always a risk when it comes to driving. But with 80 mile an hour speed limits on remote interstates and 75 mph speed limits on desert county roads, a drive across the wild west requires some extra caution while traveling with children. On the portion of our drive from Salt Lake City, Utah to Denver, Colorado, we were brought to a complete stop on I-80, about an hour outside of the city limits of Salt Lake. Just about 20 minutes before we had come to a complete stop, we had seen two police cars and an ambulance with their lights on, moving ahead of traffic. We knew something was ahead, but I was a bit confused as to why their speed was so moderate. Well, when the rest of traffic is already traveling at 80 miles per hour, I guess if you are “slowly” moving ahead of them you’re still probably going 90, which would seem racing on a normal city highway of a usual 60 mph. I had no idea however that we would be soon be at a compete stop for over half an hour. As we came to a stand still, it took about 5 minutes of not moving before we saw people getting out of their vehicles. I shut mine off and rolled down the windows and sat for awhile. My husband got out as people from the car behind us started to gather around the asphalt chatting between our vehicles. They told him that a neighboring trucker got word over his radio that there was an accident involving a motorcyclist. A helicopter was going to be airlifting him out and it was presumed that he was already dead. The sad moment set it. Yet, we were still stuck there for some unknown amount of time. I got out of the car too, but my daughter stayed in the car, occupied by an iPad. After chatting with our parked neighbors, my 2 year old got restless and realized that everyone else was outside of the car. I figured it would be a nice opportunity for her to get out and stretch her legs. We kept her close, letting her walk back and forth between my husband and I. Then I saw something that I didn’t expect while we were all parked out on the highway. A motorcycle was coming towards us from the back of the pack, splitting the lane. Granted, he was going slow, as he must have seen that there were people along the road, but my daughter was so small! I immediately grabbed her and moved behind our vehicle until he passed. We moved towards the outside of the lane, against the large grass divide that separated the east and west bound highway, hoping to avoid more. But just a few more minutes later, another motorcycle was approaching from this outside shoulder too! It was clear that there would be no place for her to stand safely out of the car. It was just another reminder that you can NEVER let your guard down when out or ON the open road. People gather out of their cars, on the road, as we wait for an accident about a mile ahead to be cleared. With the the threat of more unexpected motorcycles moving through our stand still traffic, I put my daughter back in side the car and just let her walk around inside the vehicle (a benefit of a Yukon XL!) 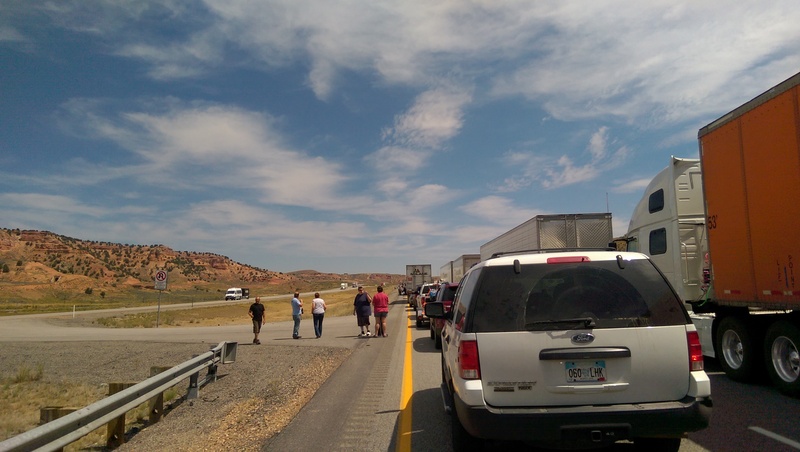 After sitting on the highway for roughly 35-40 minutes, people began getting back into their vehicles and we knew it was time to start moving. It took another 30 minutes of crawling through the traffic to move back out to “normal” speed. But the image of the motorcycle helmet laying on the side of the road, and bits of broken pieces of the motorcycle scattered along the shoulder would serve as a continued reminder for the rest of our trip how much care needs to be given to road safety. Staying in the right hand lane and letting aggressive drivers and excessive speeders pass you is not only a good idea, but a law in many states with high speed limits. We hope everyone has a safe rest of the summer, whether in the air or on the road!